For a nice change of pace, everyone loves breakfast for dinner. This is a wonderful emergency recipe. Dash into the house with everyone hungry and he or she can be fed in minutes. In a non-stick pan sauté ham lightly. Add 2 tablespoons oil and O'Brien potatoes and sauté until lightly browned, about 15 minutes. Break eggs into small bowl with chiles (if used) and mix lightly. Add to skillet and cook, stirring until eggs are in soft curds. 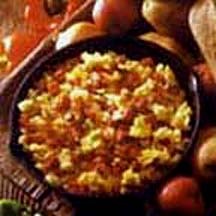 Increase heat to high; mix eggs and potatoes together until heated through. Variations: Add grated cheddar cheese or sliced black olives. Cooking Tip: While still frozen in the package, bang frozen potatoes on counter top to break up frozen lumps and make cooking easier. Nutritional Information Per Serving (1/6 of recipe): Calories 522, Protein 19 g., Carbohydrates 36 g., Fat 35 g, Cholesterol 305 mg., Sodium 638 mg., Iron 2.8 mg.